Recently, the Republican Party of Virginia held their third and final Senate debate between the four candidates. Although, to the best of my knowledge, none of the previous debates were televised statewide, I was appreciative that I was still able to watch them through the blog Bearing Drift. However, despite my searching, I haven’t been able to find the entire video of the third debate. Given that any conservative should find such a statement troubling, I searched the web in the hopes of finding video of Allen making this comment. Although I was unsuccessful, I did find a Washington Post article, which confirmed the above quote as accurate. In addition, I received a video from the Radtke campaign from the debate on this very issue last night. In response to this matter, I wrote on Facebook was that “anyone who makes such a statement should be declared unfit for federal office”. Now the average Republican voter might think that my statement is outlandish…at least at first glance, but allow me the opportunity to explain my rationale. What is George Allen really saying here? Let’s first focus on the positive aspect. The second part of his statement is that he wants our military to have the best equipment possible. I don’t find anything wrong with this line of thinking. It is actually laudable. After all, if we ask our brave men and women to risk their lives on behalf of their countrymen, it is only proper that we supply them with the best tools to protect them from harm. However, the first segment is what is truly damning. He doesn’t care whether or not Congress authorizes the use of force? What’s going on here? Has he ever read the Constitution? Does he know that only Congress has the power to declare war? And if he doesn’t care if Congress gives their approval, who does Allen believe should have control of the military? Should we have an imperial presidency where the executive branch rules unchecked? Or should these decisions be left up the generals like some sort of South American military junta? Mr. Allen, how can the military protect our freedoms abroad while they are sent on missions that run contrary to rules that underpin the foundations of both our government and society? Although George Allen was widely denounced by the media in 2006 for his so-called macaca moment, isn’t his statement here far more troubling? It is not merely some case of either racism or perceived racism, but rather shows a fundamental misunderstanding of the Constitution, the separation of powers, and the proper role of a United States Senator. It would be one thing if he were merely an ill-informed private citizen with no ties to the government, but it is quite another when he has actually served six years in the Senate and is seeking to do so again in the June 12th GOP primary. Last I checked, conservatives believe in things like federalism and a government bound by the restraints of the Constitution. Through his quote in the recent debate, George Allen has shown once again that his philosophy of government does not align with the conservative mindset of actually limiting government. I don’t know about you, but I’m terrified of the prospect of electing more leaders from either party who will trample upon the rule of law and disregard the Constitution. I sincerely pray that Mr. Allen recants the statement he made in the above video. Don’t forget that in just a few short weeks, Virginia voters will go to the polls to select the GOP nominee for Senate. I just hope that all Virginians will remember Allen’s words here. After all, we can ill afford to continue an irresponsible foreign policy ruled by a single person or cabal which is all done without congressional approval and oversight. Given that issue, do you really want to return a man like George Allen to such an important position of power? Or should we elect someone like Jamie Radtke who understands the proper role of a United States Senator? Seems like an obvious choice, doesn’t it? Update: It seems like the folks at Citizen Tom have a link to the video of the entire third debate. Check it out here! Although I’ve likely been to more tea party meetings that most people who read this article, all of these meetings have taken place within the Shenandoah Valley. Last week, however, I had the opportunity to meet with two groups outside the region. 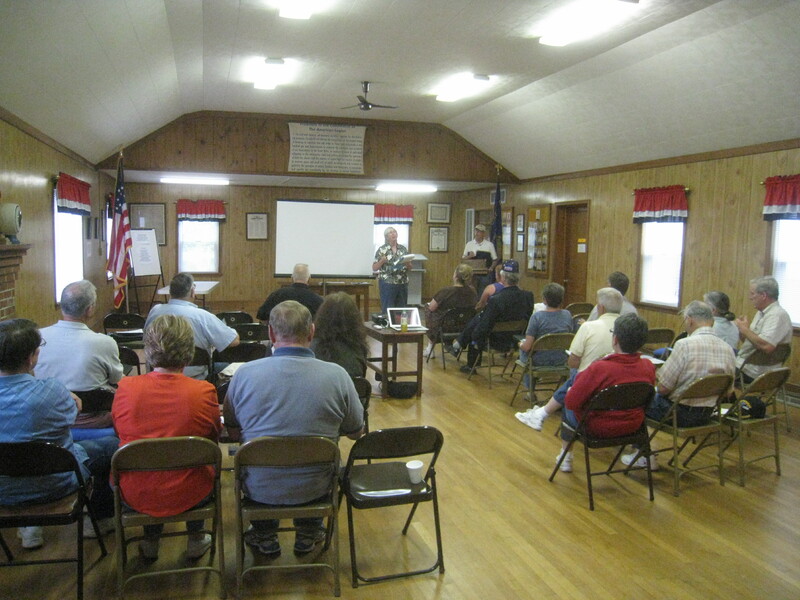 The first gathering took place in the town of Montross, Virginia on May 15th. For those unfamiliar with Virginia geography, Montross is in the Northern Neck, the northern most peninsula of the state. As you might imagine, it is a pretty rural area. This tea party mainly draws from the citizens of Westmoreland County, a county comprised of 17,454 people as of the 2010 census. Despite this relatively small population base, the tea party still boasted a turnout of 25 people. 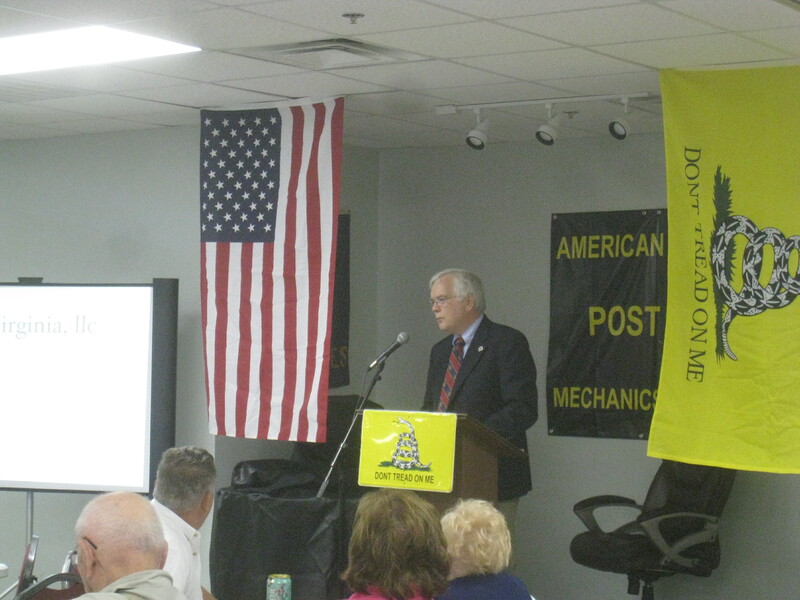 The second meeting was the Mechanicsville Tea Party on May 17th. 49 people attended this assembly. Mechanicsville, for those who don’t know, is an unincorporated community of 34,648 folks in Hanover County, a few miles north of the city of Richmond. Apparently, there are a whole host of tea party organizations in and around the city of Richmond including several in Hanover County itself. The featured speaker at these two events was Parke West of We rVirginia. We rVirginia is a relatively new group; their purpose is to educate, activate, and inspire conservatives throughout the Commonwealth in order to elect likeminded legislators in the 2012 election cycle. Part of their technology includes the rVotes system, a database and program similar to the Republican Party’s Voter Vault. One common thread I noticed between the two tea parties was the high level of support for Jamie Radtke for Senate. 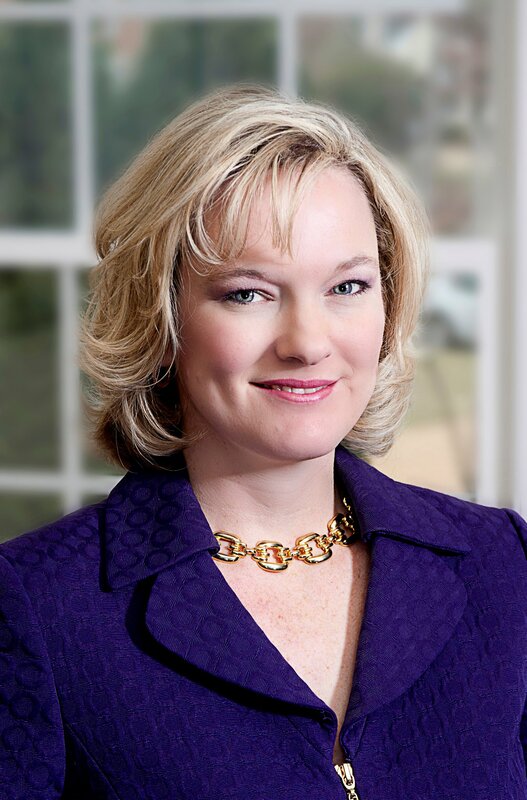 Although Jamie Radtke won the most recent straw poll in the Harrisonburg and Staunton Tea Parties, apparently, she has an even stronger following in other regions of the state. For example, approximately one out of every three of members of both the Montross and Mechanicsville Tea Party meetings self-identified as an active volunteer with the Radtke campaign. How will the efforts of this multitude of volunteers impact the June 12th Republican Senate primary? 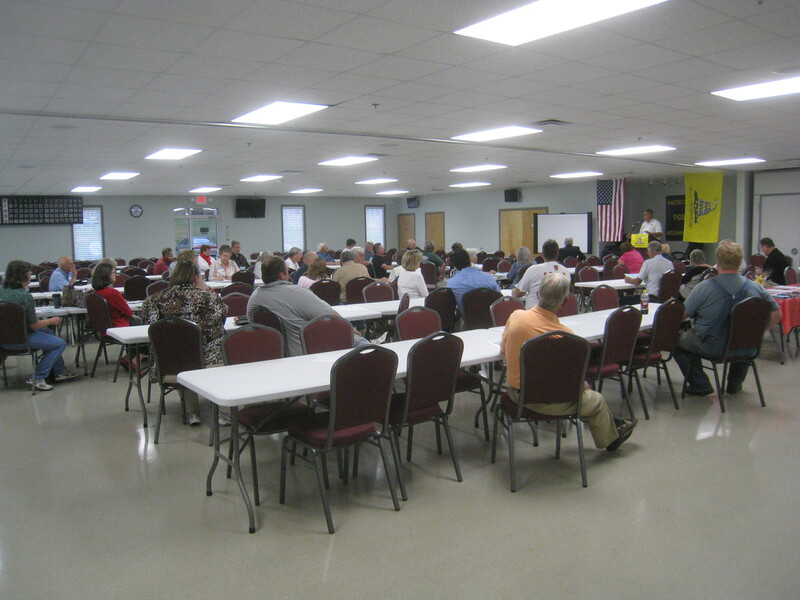 Another interesting tidbit to note was the complete lack of Cantor materials at the Mechanicsville Tea Party. Although I would argue that Karen Kwiatkowski is the tea party favorite in the June 12th Republican primary for the 6th district, Representative Bob Goodlatte still makes an attempt to reach out to the Shenandoah Valley Tea Parties. However, at the Mechanicsville meeting, there were neither Cantor campaign signs nor his literature. By contrast, I could easily find brochures for his opponent, Floyd Bayne. I have to wonder, is this situation an anomaly? Do many of the grassroots organization in the 7th congressional district oppose majority leader Eric Cantor? Or has his campaign simply chosen to ignore tea party groups like Mechanicsville? Although it is easy to assume that all tea party groups are the same given that each presumably adhere to the Constitution and the ideals of limited government, it is also true each are comprised of a variety members who each hold a multitude of beliefs, have differing levels of political experience, and view the world through their own personal lenses. I look forward to learning about other tea party organizations as we strive to promote our shared principles in 2012 and beyond. 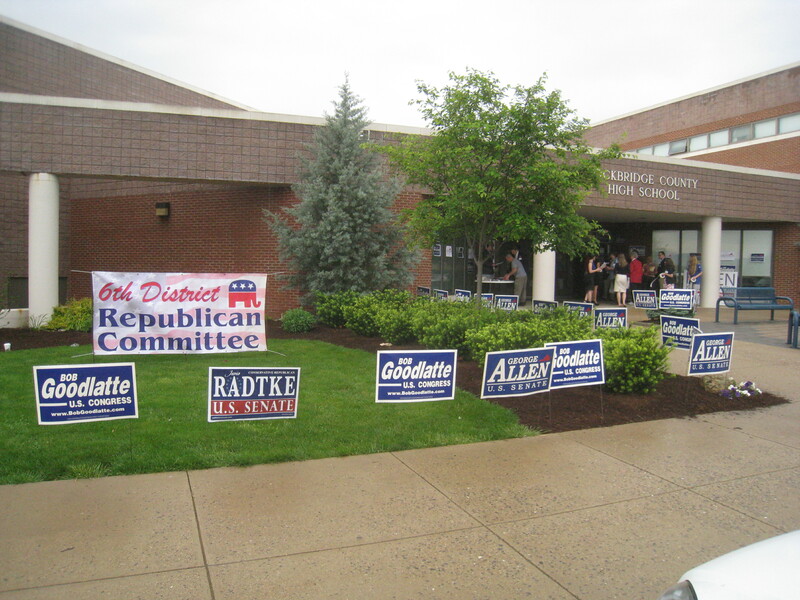 This most recent Saturday, delegates from throughout the 6th congressional district in Virginia gathered at the Rockbridge County High School in Lexington for a GOP convention. The purpose of this regional convention was to elect delegates and alternate delegates to the Republican National Convention in Tampa, select three new members of the State Central Committee (the governing board of the Republican Party of Virginia), pick regional vice chairmen for the district, elect a person to cast the region’s electoral vote in November should the GOP win, and install a chairman of the 6th district Republican Party. The event kicked off shortly after 10 AM and ran until about 3 PM or so. Needless to say, it was a long day. A seemingly never-ending supply of speeches dominated a majority of the time. Not only did each of the candidates that were to be voted upon at the convention have a chance to speak, but so did the 2012 House and Senate primary candidates, the 2013 statewide candidates, and the national committeeman and national committeewoman. Personally, I would have cut out the 2013 candidates and the national committee people, not because they aren’t important, but just for the simple fact that there were more pressing matters and the convention ran long enough without them. Certainly the most interesting element to the whole affair had to be the outcome of the voting. Surprisingly (or perhaps not), a lot of new, liberty-minded candidates emerged victorious over the old guard. Hinting at this trend, prior to voting, some activists passed out cards with either the Ron Paul logo or the Gadsden Flag encouraging delegates to vote for a slate of candidates. Can you guess what happened? Every single one of these listed candidates won. Some notable losses were: Wendell Walker, the 6th district chairman, who did not claim a spot as a national delegate. Neither did Suzanne Curran, a long-time activist after whom the RPV names one of their annual events. And Trixie Averill, a former chairwoman of the 6th district, lost her bid to return to the state central committee. 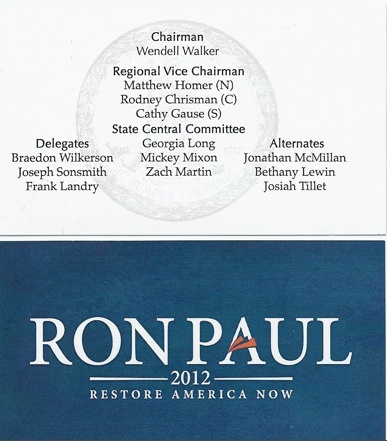 Although I haven’t seen any news outlets reporting it, the Ron Paul delegation did exceeding well. Yes, each of the three 6th district national delegates are bound to vote for Mitt Romney on the first ballot at the national convention due to the fact that Romney won the district in the March 6th primary. However, Ron Paul will sweep the district should the national convention go to a second ballot given the stated principles of the winning delegates. If the audience reaction was any indication, Karen Kwiatkowski seemed to enjoy a greater level of support from the attendees than the incumbent, Representative Bob Goodlatte. In an unexpected move, Mike McHugh, a candidate for the regional vice chair position in the northern part of the district, removed his outer clothing at the end of his time on stage revealing a bright red shirt proclaiming his desire to “fire Bob” Goodlatte. Given the apparent inability of the establishment to succeed at the convention, I was a bit surprised that no one challenged Mr. Walker for the position of district chairman. Yes, his name appeared on the card above, but was it listed there only because he faced no opposition? After all, although listed for chairman, he was not listed as a delegate. I do have to wonder that if he did face an opponent with the same principles of many of the other winning candidates at the convention, would he too have been replaced? Nevertheless, Republicans who wish to push the party back toward the principles of a limited, constitutional government ought to be generally pleased with Saturday’s outcome. 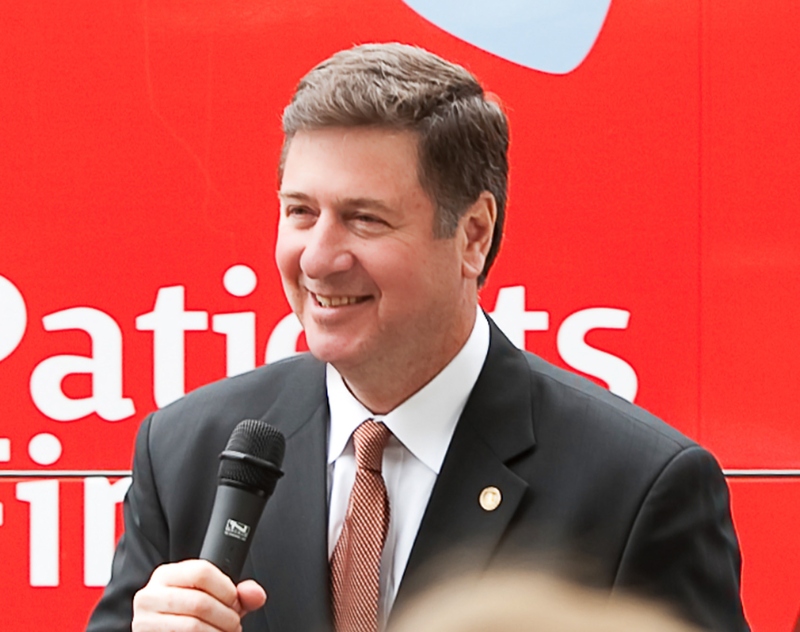 Are Valley conservatives once again “Republican for a reason”? However, a huge question that still needs to be answered is can they translate this success into nominating and electing conservatives candidates who share these values? It is difficult to say for certain, but the Republican primary on June 12th will be the next great test. VC Note: I’m pleased to present another article by Karen Kwiatkowski. Like Kwiatkowski, I am not nor have I been in favor of any kind of farm subsides. Complaints are rampant about the draft 2012 Federal Farm Bill. Farm subsidy recipients are enraged about proposed cuts, even as the same benefits would flow to them through direct payments and insurance offsets. Sustainable small farm and local food efforts complain that they are getting short shrift, and corporate agriculture is busily lobbying for its favorite programs. The 46 million Americans currently enrolled in the Electronic Benefit Transfer (EBT) Program may see reductions and restrictions, and we hear that starvation looms large. Everybody wants a piece of the federal agricultural pie. But no one seems to be questioning why this monster half a trillion dollar piece of taxpayer and debt-funded socialized program is in any way good for this country. King Corn is eyeing the possible loss of the Renewable Fuels Standard (ethanol) subsidy and seeking to gain compensatory supports for corn. The environmental lobbies are worried that programs that so many of them administer will be cut. The public debate between small sustainable food production and massive NPK-based industrial food production is heating up, as our own Joel Salatin debates with the New York Times. — Didn’t centralized government 5-year plans go out with the 1989 demise of the Soviet Union? When do we get to try the free market and liberty? — Why do the lobbyists believe Congress owes them our money? As Davy Crockett noted, it’s not Congress’ money– it belongs to the people! — Can no one envision a future where the government doesn’t pick winners and losers and try to control every aspect of the marketplace? Corporate aid to big banks is wrong. But standing tax-funded bailouts and benefits for industrial giants like Monsanto and ADM are all just fine? — In an era of nearly $18 Trillion in current federal debt, why are we clamoring for even more redistribution of wealth? — Can someone explain to me the collusion between USDA, FDA, FBI, IRS and DHS in conducting raids, confiscations and general harassment of small food producers and retailers all over the country? What part of the budget can we cut to relieve us of this idiocy? I have a radical idea. Let’s let farmers grow and raise what makes sense to them, and let consumers buy and consume what they want. Let’s get the corn syrup, white flour and Monsanto bought-and-paid-for bureaucrats out of policy-making. Why not put private property rights first for a change? Is it possible in America to encourage liberty and personal responsibility instead of farmer and consumer dependency on government? I don’t take or apply for federal or state subsidies for my farm, and I never will. I don’t think my children and grandchildren can afford it. And I’m pretty sure yours can’t either.